First there was Brownie Bark, then along came Chocolate Chip Cookie Bark and Monster Bark followed closely by Snickerdoodle Bark. Somewhere in between was an oatmeal version, but it was lighter and more of a cookie brittle. So far, my favorite members of the cookie bark family are crunchy rather than light and crispy; and this ginger cookie bark is especially crunchy because I created it by transforming an old biscotti recipe. It only has 1 tablespoon of oil and the rest of the fat comes mostly from the egg and nuts. I have made this recipe only once, but I made brownie bark only once before posting and people were able to recreate it at home quite successfully. 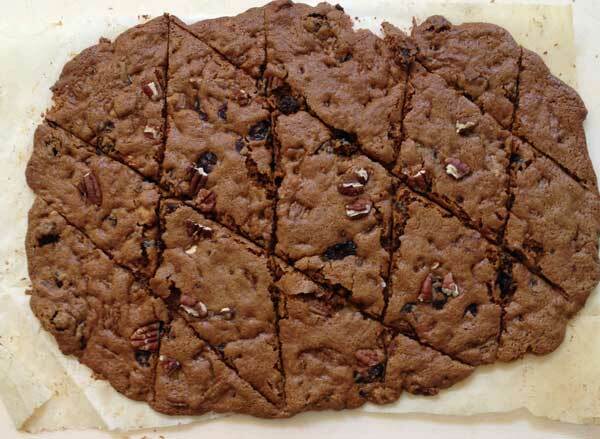 So if you make the new gingerbread cookie bark and have issues, let me know and we can perfect the recipe together. But I feel like this is a good version and will definitely make it again in the next couple of weeks. I don’t post that many step-by-step visuals because my photography skills aren’t the best, but maybe these photos will be helpful nonetheless. The first stage of bark making is pressing the batter/soft dough into a thin slab. It will puff up a bit as it bakes. Here’s what it looks like after being baked for 28 minutes and scored while warm. When it has cooled slightly, the bits are separated and carefully transferred back to the baking sheet. It’s raggedy at this point and may fall apart, but the pieces around the edge should be firm. After being scored and separated a bit, the cookies go back into a not-too-hot oven which dries them out a little more and makes them crunchy throughout. 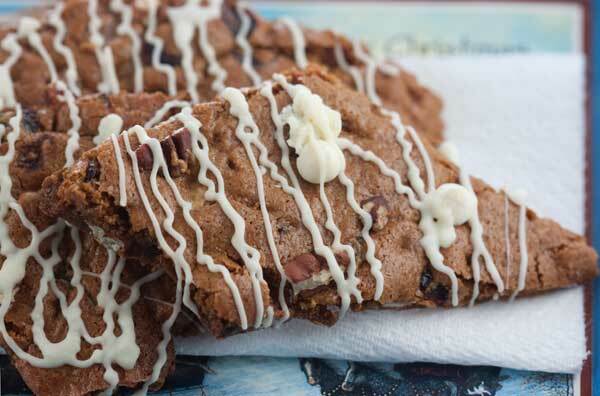 It’s up to you whether or not you want to drizzle it with melted white chocolate. If you decide to do so, I recommend mixing some Ghirardelli white chips with coconut oil (just enough to coat) and microwaving them at one of the lowest powers, stirring every 30 seconds. You can squeeze the melted chocolate out of a decorating bag or freezer bag or you can just spoon it over. Ginger cookie bark is a hard and crunchy free-form cookie similar to brownie bark but with flavors of molasses, robust spices, nuts and fruits. Preheat oven to 325°F. Line a large cookie sheet with parchment. In a large mixing bowl, combine the flour, brown sugar, ginger, baking powder, cinnamon, salt, nutmeg, and baking soda and stir until thoroughly mixed. In a measuring cup, lightly whisk the oil, molasses, egg, and vanilla. Add the liquid mixture to the dry mixture and mix until dough is well blended and forms a big ball. Work in the nuts, berries and ginger. 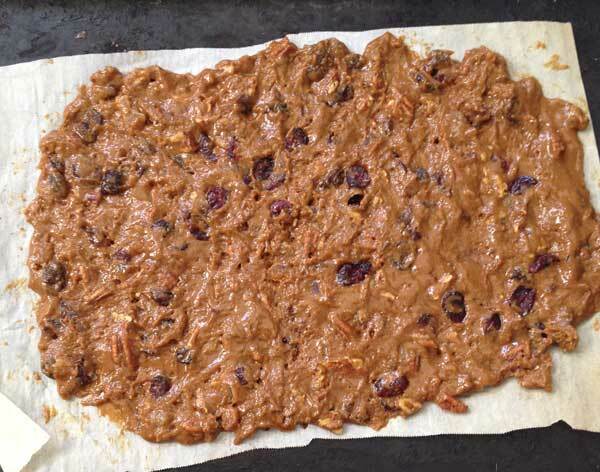 Press the dough into a flat slab on a parchment lined heavy duty baking sheet. Keep in mind the dough will rise a bit as it bakes, so try to get it pretty flat (see photo). Bake on center rack for about 28 minutes or until dough is puffed up, set around the edges and kind of soft set in the center. Pull from the oven and slide onto large cutting board. Let cool for about 3 minutes. With a pizza cutter, cut dough into large, jagged pieces, but do not separate quite yet. Let cool for another 20 minutes. Carefully separate the pieces so that the edges are exposed. Some may break, but that’s okay. Pieces around the edge should be more set. Put the pieces back on the parchment lined baking sheet and bake for 20 minutes at 250 degrees F.
Remove from oven and carefully transfer pieces to a wire rack to cool completely. Melt some white chocolate & coconut oil and drizzle over top if desired. Made this today and it’s excellent! Thanks for another fantastic recipe. Thank you for this! Can’t wait to make it. Your brownie brittle recipe is my all time favourite recipes from your site! 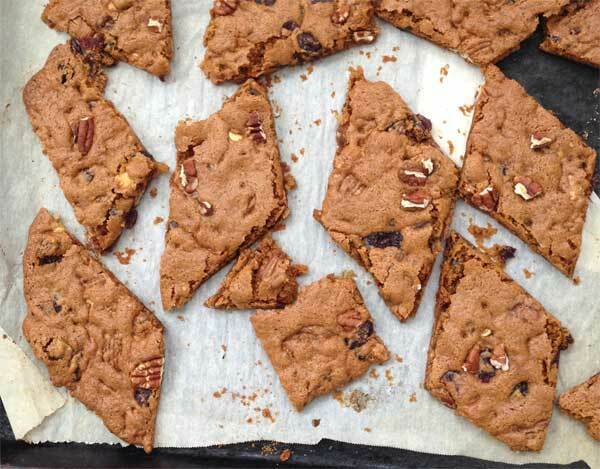 I love the idea of transforming a biscotti recipe into a bark recipe… my head is spinning with all of the possibilities!